It would be great to get all the sulfur we need from the foods we eat, but we don’t! Every element we know on the periodic table sulfates out of the human body. Our bodies are comprised of 4% sulfur, but does not store sulfur nor make it. We should get sulfur from the foods we eat, but the use of chemical fertilizers we believe; has broken the sulfur-cycle. This Sulfur food is used by our bodies to determine cell wall permeability and oxygen transport into our cells – since it has been missing from our food due to mandated artificial fertilizer use since 1954. Generations of us without enough of the 3rd most abundant element in us. Some claim high purity level products, but our Sulfur product contains the highest purity, and the highest crystalline matrix life force. You may find less expensive products, but they are processed with additives and anti-caking agents. A biologically active form of organic sulfur found in all living organisms. Naturally found in varying amounts in raw unprocessed milk, meat, fish, fruits and vegetables. Our Organic Sulfur has multiple uses and has been used by fitness enthusiasts everywhere, especially the aged who have had the longest Sulfur deficiencies. Most of others are not alive like this one! Can you ship to U.K. England? I am thinking of ordering from Canada and want to know if the shipping is the same if I order one or more containers of sulphur. Thank you. We can do it soon! How about to Guam (we are a US territory)? Could you please answer the question regarding shipping to UK or Europe? On the radio show you state this is possible. On the website only “canada” is listed as an option. i cant find it on apoticaria, what is it called over there? can anyone xonfirm that the sulfur over there is the same as andy is taking? Australia? Can you ship to aus? I am interested in the organic sulfur too, and am in Australia. Do you have more details on international shipping or any other information. Re the Open Phone Friday comment, it is two hours long, could you give a hint as to which hour the info is covered, or write the basic information out somewhere. Thanks. Here’s the simple way to do it for now. 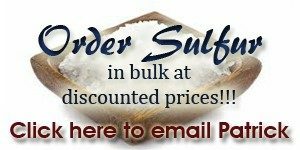 Anyone outside U.S. and Canada, we will ship you two pounds of sulfur for $99 delivered. email [email protected] your complete shipping address and telephone number and your order. Then donate the $99 to our site, top right of front page donate graphic and we’ll get it done. If you want more than two pounds email me and I will send you the exact price. Appreciate your patience with this. My name is Gunnar I am sending this email from Denmark because I would love to try out the organic sulfur product on your web site. A paypal donation of 99$ has been made, but I am unable to send email to this address [email protected]. Always get a error domain name not found. I have tried with 2 different emails and one of them is a gmail account. Hope to see this problem sovled soon. Best regards Gunnar. How much to take each time and how many times per day? A teaspoon in the morning and a teaspoon in the late afternoon ot however you want to do it. I wouldn’t do it past 5 or 6PM and that’s still to late for some folks. I just do it one time in the morning around 10AM. Works for me. Just listen to your body. It will tell you what it needs. Anybody know of any side effects on the kidneys from taking this sulfur product? I have been taking 1 heaping tsp for a month or so and now i seem to be having some back pain my chiropracter says could be related to my kidney. 1. You should be taking 2 teaspoons each day. One in the morning and one in the evening. 2. If you are having any kind of detox reaction (like kidney pain) you should increase the amount of sulfur you take until the pain goes away. Do not forget…sulfur is food. It is not a drug. I am still waiting on an answer Patrick regarding what do you make your in house Sulfur from ? what are its ingredients? We get out sulfur from Patrick McGean, The Sulfur Study. Patrick sources from various places and it is DMSO and Hyrdrogen peroxide is how it is made..each batch is tested and it is the purest organic sulfur we know of. It does form crystals at the bottom of the glass…so, it’s the real deal. Hope this helps. I am currently reading a book : It’s the liver stupid pdf format off the web and the author suggests that to be effective MSM 99.9% pure should be taken by swishing the crystals/powder around in the mouth to be absorbed via the mouth tissues, then swallowed, followed with water. After a while, one doesn’t notice the taste. My daughter 8 has be diagnosed with Focal Epilepsy and only during sleep she has seizures. Also they found on her right frontal lobe a small legion 4.5 mm size and they are pretty sure it is a cyst and it did not give any signals which means it is not growing, but they will do another MIR tomorrow just to make sure that is the case. I want to start her on Organic Sulfur but I am not sure with her condition and her age if it is safe and what amount to start. I know she can have flu like symptoms in the beginning, and also I am concerned what will this Sulfur do to her cyst in the brain as I am afraid if the liquid in the cyst leaks during this process and cause even more problems? Just need some help and I really would like to help my daughter as the doctors have put her on 2 different medications and I don’t see them helping her. Thank you so much .